We’re always being urged to eat at least five portions of fruit and vegetables every day and for many people this can be difficult. It can definately be more tempting to reach for a bar of chocolate or packet of crisps than to choose an apple, orange or carrot. However, blending fruits and vegetables into a delicious, thick smoothie makes them easy to incorporate in your diet with all the vitamins, minerals, nutrients and fibre intact. If you include yoghurt or milk, you get some calcium and protein as well. If you make your own smoothies at home you can avoid high fat and high sugar ingredients, and choose those that you really like. You can also smuggle in things you don’t find particularly palatable but know are good for you, such as kale or celery. The other advantage is that you can chuck in those things that are lingering in the fruit bowl or salad drawer, so they don’t get wasted. Of course, if you’re a real fan of smoothies and want to make soups and other recipes too, you could invest in an expensive food processor, but we’ve found simple blenders on the Internet for as little as £10.00 - £35.00, so making your own smoothies can be an affordable option. Just remember that the more powerful the motor, the better it will cope with blending hard fruits and vegetables; with a cheaper blender you may have to chop them into small pieces first. 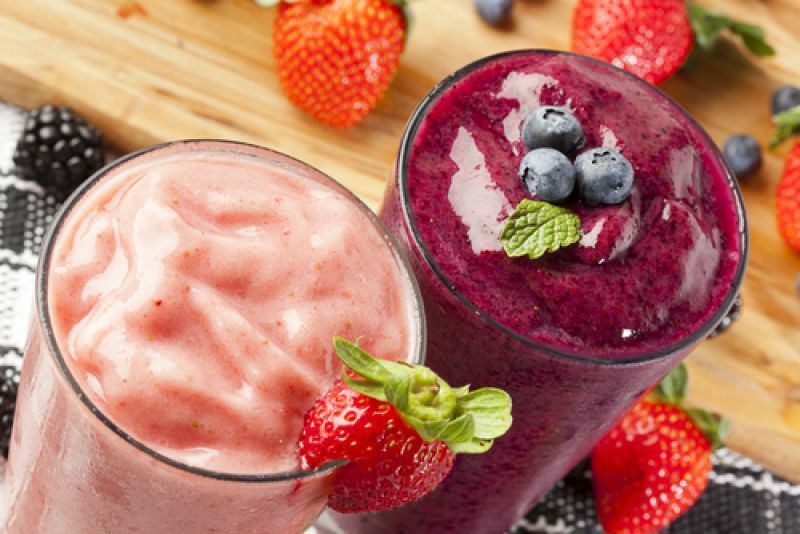 Smoothies make an ideal post-workout snack, especially in hot weather when you don’t feel like eating anything heavy, so here’s a basic recipe to try. It includes a banana, which provides natural sweetness, carbs, fibre and potassium and makes the drink creamy. You can dream up your own variations or find lots of other suggestions on line. Put the ingredients in a blender and blitz until smooth. Pour into a glass and enjoy!